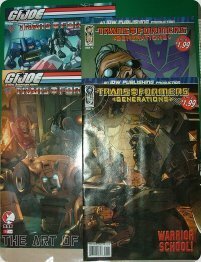 I was at SM North EDSA yesterday and had no intention of spending much when suddenly, I happened to pass by Comic Quest and I realized that I hadn't been updated in my Transformers Comics collection since February 2006. I was surprised to learn that there were new series, issues and reissues that I didn't have yet. I ended up buying 4 out of 6 comic books I didn't have yet. I would've bought 6 but my budget didn't allow me to. Actually, it's not a matter of whether I'd buy or not... it's a matter of how much I'd have at hand and what could I buy with that. LOL! I got Transformers vs GI Joe new series and 2 reissues from 1986. Now I'm happily broke. hehehe !